WRDWTV: Tanya Mount said she is being targeted by the administrator at her daughter’s school after a meeting between the two several weeks ago. “I feel like a criminal. I want I want to be heard. I want a public apology,” Mount said. On Wednesday, Mount says she was handed a notice from Richmond County Board of Education Police. “He tells me that were going to issue you a criminal trespass warning,” Mount said. The notice banned her from McBean Elementary School where her disabled daughter attends. She asked what she did wrong. She said the police told her the principal was afraid of her. She says they asked if she was in the Army and if she had a concealed weapons permit. Mount replied yes to both questions. 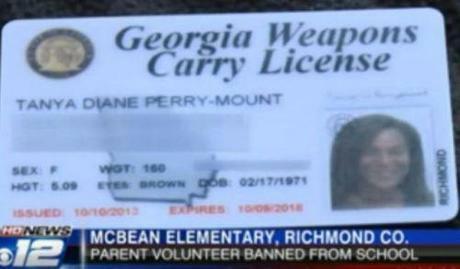 Mount who is a parent volunteer says she is banned from the school for posting a picture of her new concealed weapons permit on her Facebook page. She says she has never had any problems with Principal Janina Dallas but says she was blind-sided weeks earlier during a meeting with Dallas. “She told me that instead of volunteering at the school and playing on the play ground with my daughter I need to be at home doing grown up things,” Dallas said. We tried to speak with the principal, but were told she was unavailable. A district official told News 12 that the principal met with Mount regarding her role as parent volunteer, but did not know the full details of the meeting. Mount says she feels targeted for no reason. “I feel that this is some high school crap. He said she said. She should have contacted me instead of taking the legal route which was uncalled for,” Mount said. Mount re-confirmed to News 12 that the district gave her permission to transfer her daughter from McBean to another elementary school in the district. Reason to ∞ home school.